UnitedHealth earnings for the first quarter of 2019 have UNH stock falling on Tuesday. UnitedHealth (NYSE:UNH) reported earnings per share of $3.73 for the first quarter of the year. This is an increase over the company’s earnings per share of $3.04 from the first quarter of 2018. It was also above Wall Street’s earnings per share estimate of $3.59 for the period, but wasn’t able to stop UNH stock from dropping today. The UnitedHealth earnings report for the first quarter of 2019 also includes net income of $3.56 billion. That’s better than the company’s net income of $2.92 billion reported in the same period of the year prior. Operating income reported in the UnitedHealth earnings report for the first quarter of the year comes in at $4.83 billion. This is up from the company’s operating income of $4.05 billion from the same time in 2018. UnitedHealth earnings for the first quarter of 2019 also have revenue coming in at $60.31 billion. The company’s revenue from the same time last year was $55.19 billion. Wall Street was looking for it to report revenue of $59.71 billion for the quarter. All of this sounds like good news for UNH stock. So why is it down today? The drop may have something to do with pushes from Democratic Presidential Candidate Bernie Sanders for a “Medicare for All” proposal. UNH CEO David Wichmann came out against the plan saying that it would destabilize the healthcare market, CNBC notes. UNH stock was down 4% as of noon Tuesday. 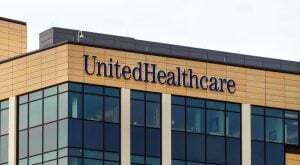 Article printed from InvestorPlace Media, https://investorplace.com/2019/04/unitedhealth-earnings-stock-is-down/.